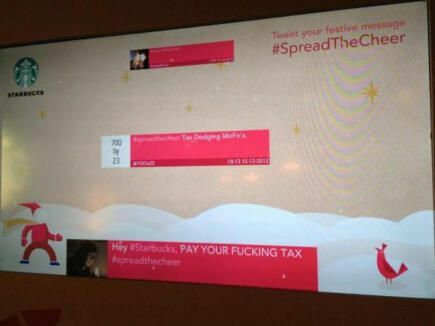 Starbucks is making a good case for testing customer loyalty right now – their tax-paying practices have made a ding into goodwill and sentiment – with the UK ‘bashtagging’ captured here by Mashable. I used to see Starbucks as a big success story – the magic of Howard – the corporate culture and power to the barista to make a difference. But right now its gone all out of shape for them in the UK – no cinnamon latte for me this christmas time. The picture above is from the big screen in the Natural History Museum in London over the weekend – it went wrong – the message is clear – they are in a pickle – and not doing well in handling it. But how would we play it differently if we had the master keys to the corporate bean grinder? According to this paper, while customers with a strong relationship with the brand may be more forgiving, when they do complain publicly (e.g., on website), they also exhibited a heightened desire for revenge (e.g., tell friends about the problems they experienced) and avoidance(e.g., cut interactions with the firm). This desire is not only more intense than that of other customers, but also lasts longer. It is a bleak picture. Once emotionally committed customers complain publicly, they seem unable to let go – love turns into hate, and patronage seems lost! Right now Starbucks would kill to get the love back again – forget growth – just rewind the clock would be nice – keep their heads down. Maybe play it differently. It’s also interesting in the age of Big Data just how the impact would have been observed from till receipts. What was the algorithm they used to decide how much tax they should propose paying? What is the value of the customers they have lost for good (Outraged switchers) vs those that could be pacified by seeing a tax-offering vs those that ‘just don’t care’. Just how did they price that impact to brand and come up with the sum for a self-declared tax offering? So how do we know who is actually playing nice in this game? I’d like to see all the coffee chains shown in the infographic – all in a row – let’s see how they compare visually and how many are contributing to UK Plc. Some caffeine transparency. Unfortunately the CFO of the company paying the most tax is unlikely to do his professional standing too much good – the tax-minimising Starbucks guys have mastered the art by any boardroom metrics.I wonder if the CMO can evidence brand goodwill for being a better corporate citizen and justify the tax paid through improved brand sentiment? But maybe I painting this unfairly – is this just about business? Isn’t strategy about winning for the firm? Arn’t these guys managing Starbucks just being good custodians for the shareholders? What would you do differently if you were in their shoes? How would you #SpreadTheCheer this christmas? Categories: Business | Tags: Business, Reputation, strategy | Permalink.